Hear that? That’s not the sound of violent indigestion. That’s the sound of millions of geeks suffering from consternation. Last week, a reliable source in the comic book news domain floated a tidbit about more upcoming X-Men movies. Apparently, in addition to the upcoming theatrical releases X-Men Origins: Wolverine and X-Men Origins: Magneto, there will be a slate of lower-budgeted direct-to-DVD X-Men Origins films based on “geek favourite” characters. Hence, the consternation. On the one hand, geeks can look forward to more X-Men film goodness, and without any threat of Ratner-induced brain cell damage. On the other hand… low-budget, direct-to-DVD? Jarring images from 1997’s Justice League of America movie suddenly spring to mind. That’s not a chainsaw. 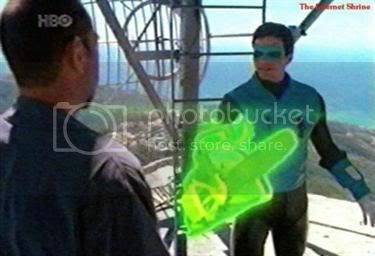 Green Lantern is flipping the bird to geeks everywhere. Well, you know me… I’d rather be part of the solution than the problem! (Unless The Office is on, of course. Or I’m in the middle of a meal. Or I’m napping. Other than that, though… I’m on the case!) And so, I offer producers my geeky expertise in casting a group of secondary characters from the X-Men universe with affordable (read: B-list) talent. 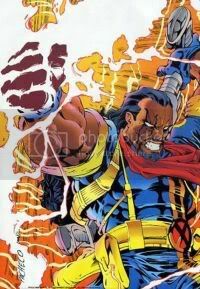 Irish mutant Sean “Banshee” Cassidy can wreak havoc with his “sonic scream,” shattering stone and knocking people unconscious. And you thought your parents were scary when they yelled at you. Do you know any other fresh-off-the-boat, B-list, Irish actors? Yeah, me neither. Plus, you know he’ll take any work he can get. I mean, he’s already made the token appearance of a has-been actor on an episode of Law & Order. 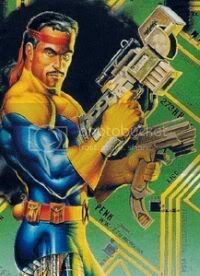 Bishop, a time-traveling mutant from the late 21st century of an alternate timeline (follow that? ), can absorb energy and then project it away from his body in a concussive blast. You’d think that power would obviate the need for guns, but Bishop still carries them. Big ones, too. Perhaps it’s some sort of alternative-future-timeline Freudian-compensation thing. Van Peebles shares Bishop’s love of guns. So says New Jack City. And Solo. And Gunmen. And Posse. And… now I’m tired. Further, I challenge you to find a black actor cheesy enough to grow his hair into a long, full mane. Or haven’t you seen Highlander III: The Sorcerer? 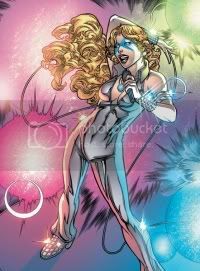 Dazzler (Alison Blaire to her mutated-DNA friends) can absorb sound and change it into a light show. This entertaining yet otherwise useless power helped launch her career as a singer (and helped her save a bundle on roadies!) before she became an X-Man. Eventually she learned to focus her light powers into concussive lasers. However, she arguably disarmed more bad guys with the powers of her ample, omni-present cleavage. Right. I think the blonde hair and the singing and the hearty boobages make my case pretty self-explanatory. And the good news is, producers can save beaucoup bucks on special effects by slathering her with body glitter and pointing a flashlight at her. Forge, member of the Cheyenne tribe, lost his hand and leg in the ‘Nam. 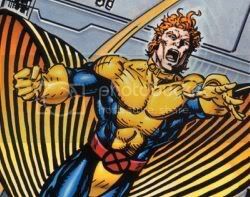 Good thing his mutant power makes him a wicked-smaht inventor… he just built himself some new appendages. Talk about a handy power. I bet his Xbox 360 never gets the Red Ring of Death. Mexican-American Olmos is a master of ethnicities. And I don’t mean that in a Master Race sort of way. I mean the dude has played everything from Latino to Asian (in Blade Runner). Give him some longer hair and a drinking problem, and he can definitely pass for Native American. Plus, Olmos has that weathered look about him. Unless Forge has invented some kind of super derm-abrasion formula that wasn’t mentioned in any comic book, I think it’s fair to assume that Forge is weathered-looking, as well, after having lost a couple of limbs. In the ‘Nam. 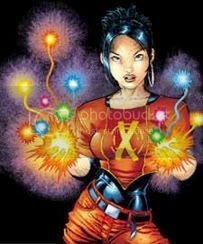 Jubilee can produce little globules of plasma that she calls “fireworks.” She’s also, like, really good at gymnastics… which isn’t a power, but totally makes her different from other characters who can project light (Dazzler) or little explosions (Boomer). She often teams up with her buddy Wolverine, because–let’s face it–with powers like hers, she’s well-served to hide behind someone who’s nearly indestructible. Sensible girl. You know… that spunky Asian broad from TV’s Chuck. She’s got that perfect tomboyish pluck. And by “pluck,” I mean she has that look about her that says she’s probably dropped a lit M80 in a toilet or two in her time. This is so spot-on it’s scaring me. Don’t be afraid. Accuracy is good for you. YES!! “Julia Ling” even sort of ryhmes with “Jubilee”, if you say it fast enough and slur it a bit, like you’ve had a few drinks! Great casting, oh mighty Snark. How did I miss this post? Great stuff! Dazzler, wtf? Maybe she’s Marvel’s version of Ethel Mertz? You know, the non-character who’s so lame that she makes all the real characters around her look that much more substantial? I really enjoyed X-men orgins much more than the firt X-men films, fantastic film, really gritty! Also want to give the game a go too! Next post: Reader Poll – Do you care about the Speed Racer movie?